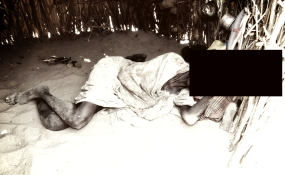 This image taken on March 17, 2019, shows a villager at Kamekwi in Turkana Central who is in dire need of food. The Kenyans for Kenya hunger initiative in Turkana has come a cropper after projects developed under it were abandoned long time ago. The famed project sponsored by the Kenya Red Cross in 2011 and supported by a number of corporate organisations and celebrities - and boosted by millions of Kenyans who contributed as little as Sh10 - ran for only three years before it grounded. More Sh700 million in cash and Sh300 million in kind were collected from the initiative and most of the money was invested in farm projects that were to serve as a long-term solution to the often deadly hunger in the arid county. Later, the initiative won Kenya Red Cross Society, Gina Din Corporate Communications, Safaricom Foundation and KCB Foundation the overall PR Campaign of the Year 2011 Award for their joint entry. Nation journalists visited one of the abandoned farms in Nakinomet in Kibish Sub County on Thursday and found hundreds of rusting poles that once held shade nets for flourishing crops beneath them. Black pipes that once let flow millions of litres of water into the farm have been destroyed and were strewn all over the farm. A wire mesh around it went down years ago. Camels have since made the farm their home as they feed on the shrubs that have sprouted from it since it grounded in 2017. Residents of Nakinomet village who benefitted from it said they had been thrown into starvation since the project went down. "We cannot lie that we did not benefit from the project because we made money from the crops we planted here. We had enough for ourselves and then extra to sell," said Mr James Ngorupus, who said he once made Sh12, 000 from crops he planted within the farm. At least 30 residents were roped in by Red Cross to put up farms within the site. They planted tomatoes, sorghum, kales and some maize. The residents said the nets that were protecting the crops from the scorching sun were torn and were not replaced. A pipe that let in water from a nearby tank also malfunctioned. They are now using the torn nets to cover the rooftops of their manyattas. "There were no deaths from hunger here when the project was on, now deaths are back. So far we have lost eight people to hunger this month alone," said Mr Richard Ekal, one of the beneficiaries.